The Symphony of Blades is the final boss of the Depths of Malatar. 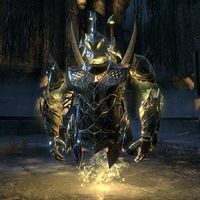 It is King Narilmor transformed into an avatar of Meridia's power, in the image of an Auroran suit of armor with four arms and blades. In Veteran mode, burning the Dictates of the Lady of Light will trigger hard mode, where it will now summon colored dark orbs. During the fight, it can summon the four colors of Aurorans to aid itself, which will converge from each corner of the room to join it in the center and empower it. It will also summon the Auroran Phalanx, a formation of Aurorans that march with Meridia's Light at their side and will empower the Symphony of Blades if they cross paths. After reaching around 10% of its health, the Symphony of Blades will transport you to the Colored Rooms, healing itself back up to 25% of its newly increased maximum health. It can also summon the Auroran Phalanx in the realm, spread up into various groups marching in different paths, three Aurorans being in each group. The boss will send fire aoes spiraling everywhere. You should try to avoid these. He uses them when he is powered by a red Auroran shade. This ability is probably what happens if you try to exit the arena and run into the barriers of light blocking the two exits. This ability is similar to the Templar skill. The boss will shoot a beam of pure light from his hands at the tank. This ability is powered up if a golden auroran shade reaches him. The boss will spin his arms around and around, dealing significant damage to anyone caught in the aoe. It is similar to the big swingy-arms aoe used by the Mournful Aegis enemy found in Hew's Bane. When empowered by a blue Auroran shade, the boss will call down lightning aoes from the sky that deal more damage if you are hit in succession. Before engaging, the dialogue is recorded as King Narilmor before he transforms into the Symphony of Blades, it says. "For three thousand years I have protected the Wrathstone! I will not fail her now!" "Warriors of Light! Join me!" "Her power is limitless, as are her legions!" "By her will, we stand united!" "Meridia, lend me your power!" "Bask in the full spectrum of pain." "Her power courses through me!" "Now you will know despair!" "I shine in perfect glory!" "Water knows how to obey, and blood is its cousin." "There is order in ice. Rigid and pure." "The cold will leech your insolence until you are frozen in eternal supplication." "Your ashes will be pure, at least." "Lightning is the whip she will use to break you!" "Her light will flash from the sky and smite you!" "You will know the sun's fury." "The sun warms the righteous, and scorches the worm." "You have yet to taste her power! Gaze into the infinite!" "Your will was never a match for hers." "The light has seared you clean." "Your lives are hers, as they have always been." "Supplicants, you will serve for all time." "Her will, is now your will. Rejoice." "However you may try, you cannot resist her." "All must kneel before the Lady of Infinite Energies." "Kneel before me, and I will make you pure." "This is the domain of the Lady of Infinite Energies and I am its guardian." "We will find you. Her reach is boundless!" "Symphony of Blades" is the name of one of the attacks of Mournful Aegises. Symphony of Blades will now break from being stunned, should all of its summoned Aurorans be defeated. 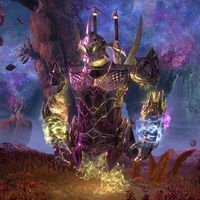 Symphony of Blades will no longer sometimes get stuck in its Radiant Destruction animation and visual effects after the ability has completed. This page was last modified on 12 March 2019, at 01:18.